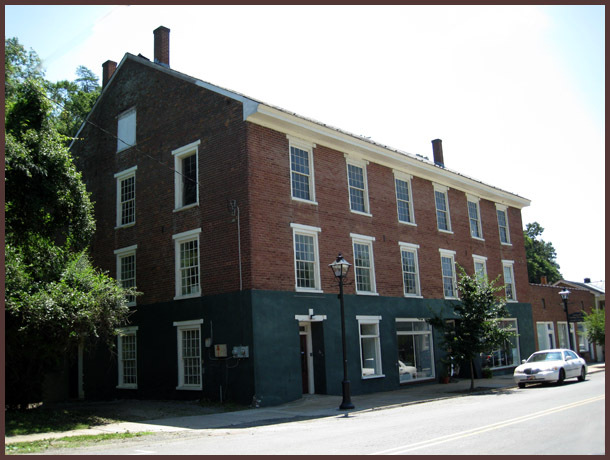 Comments: Built around 1840, this large, three-story brick building at 571 Valley Street was a tobacco factory and warehouse as late as 1880. The tobacco brands produced there included 'Tuberose' and 'Mason's Select.' Former Mayor Raymon Thacker remembers playing in the upper story of this building around 1915 and noted there were still several tobacco bales onsite. Later this building served as a braid factory, and in the 1960's a Western Auto store operated from this site. In 2010, this building served as an art studio for avid amateur artists and hosts community art shows on occasion. In August 2011, the James River began operation as a very successful brewery and opened a beer garden with live music in 2013.